The Office of Naval Research sponsored multi-phase program (N00014-17-C-2015) allowed Atrex Energy to design and develop a Hybrid Energy Storage Module (HESM) for use with tactical generators and advanced energy storage including renewable DC power sources. It is a flexible modular power management system that can control power flow from any number of its DC inputs to a DC output load. The HESM has 3 discrete inputs that are prioritized based on energy efficiency. The key goal is to embrace energy harvesting from renewables while prioritizing the source use for optimal fuel efficiency. For more information see the IDTechEx report on Distributed Generation: Minigrid Microgrid Zero Emission 2018-2038. Each of the DC inputs has a wide acceptable voltage range from 20-80V. They can be configured to output a voltage between 20-60V and up to 5kW of power. Each input can be programmed for a solar array with MPPT capability. They can also be configured to maintain a battery bus at 24 or 48V while also utilizing the bus to supply the output load when fully charged. Power flow can be bi-directional to fully rated power.This allows for conventional lead acid or Li-Ion batteries to be charged and discharged on a given input. Finally, the HESM can interface with smart battery technology via an external energy storage connection that seamlessly integrates into the power manager. Atrex Energy has been deploying SOFCs in commercial applications for >7 years and has demonstrated continuity of its flagship product for over 35,000 hours. They have now deployed more than 600 fuel cell stacks in varied remote power markets utilizing well head natural gas or LPG as fuels, collectively accumulating >6 million hours of operational life time. "HESM will be a stepping stone for developing commercial power management hardware including high power DC-DC converters and flexible power managers to integrate the commercially available Atrex power generators with other DC sources", said Dr. Praveen Cheekatamarla. This technology would enable the integration and management of a customer's DC power sources including renewables. Prioritization of energy efficient sources would improve site fuel efficiency. The manager would also enable the integration of multiple fuel cells for higher power output than is currently available. This technology offers many possibilities increasing Atrex Energy's value proposition to its customers. 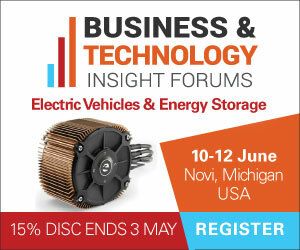 Learn more at the next leading event on the topic: Business and Technology Insight Forum - Novi June 2019 on 10 - 12 Jun 2019 at Novi, Michigan, USA hosted by IDTechEx.